Pictured at the prize-giving of the A&L Goodbody Bold Ideas Student Innovation Award 2017 are Front L-R: Sarah Lennon, Legal Counsel at Google (judge), and Conor Leavy, DCU (winner). Back L-R: Jonathan Newman, Senior Counsel, (judge); Aine McCarthy, Trinity College Dublin (runner-up), John Whelan, Partner and Head of A&L Goodbody's Commercial and Technology Group (judge) and Dylan Markey, Maynooth University (runner-up). Conor Leavy (23) from The Curragh in Kildare, and a final year law student in DCU has won the 2017 A&L Goodbody Bold Ideas Student Innovation Award, following his proposal to establish the Irish Data Protection Ratings Agency (IDPRA). With data protection and privacy looming large for Irish businesses ahead of the introduction of the General Data Protection Regulation (GDPR) next year, the winning submission puts forward the idea of establishing an independent rating agency for the data sector which would showcase Ireland as a destination with the highest data protection ethics and practices. This is the sixth year that A&L Goodbody has held the Bold Ideas competition, which saw over 1,200 members of the public cast their vote on Facebook for their favourite submission, following which the winner and runners up were selected by a panel of three expert judges. Speaking at the awards ceremony, John Whelan, Partner and Head of A&L Goodbody's Commercial and Technology Group commented: "Bold Ideas inspires creativity and bold thinking among students and this year it gave students the opportunity to showcase great ideas to enhance Ireland as a global centre for data when the EU GDPR is introduced next year. Conor's idea to establish the Irish Data Protection Ratings Agency impressed the judges as an innovative and unique way to encourage businesses to establish here." 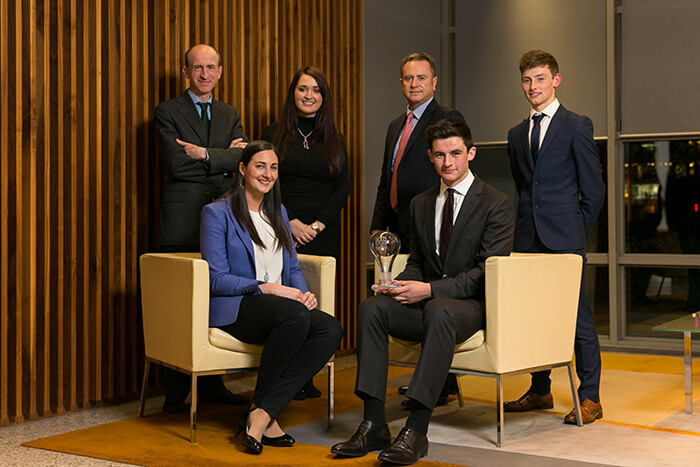 Presenting his Bold Idea at a prize-giving event in A&L Goodbody's Head Office in Dublin, winning student Conor Leavy said, "I would like to thank A&L Goodbody who provided such a great opportunity in running this competition. The introduction of the GDPR is the topic that I have chosen for my final year dissertation, so this competition has not only been a great help in my final year preparation but has also been an opportunity to engage with a topical and current area of the law." As first prize winner, Conor receives €4,000 in cash and an internship in A&L Goodbody’s Head Office in Dublin. The firm will also make a donation to a charity of his/her choice. The runners up in this year’s competition, Dylan Markey from Maynooth University and Áine McCarthy from Trinity College Dublin both received iPad minis. Judges for the 2017 competition were Sarah Lennon, Legal Counsel at Google, Jonathan Newman, Senior Counsel, and John Whelan, partner and head of A&L Goodbody's Commercial and Technology Group.